How would you summarise Sea and Islands in a couple of sentences? 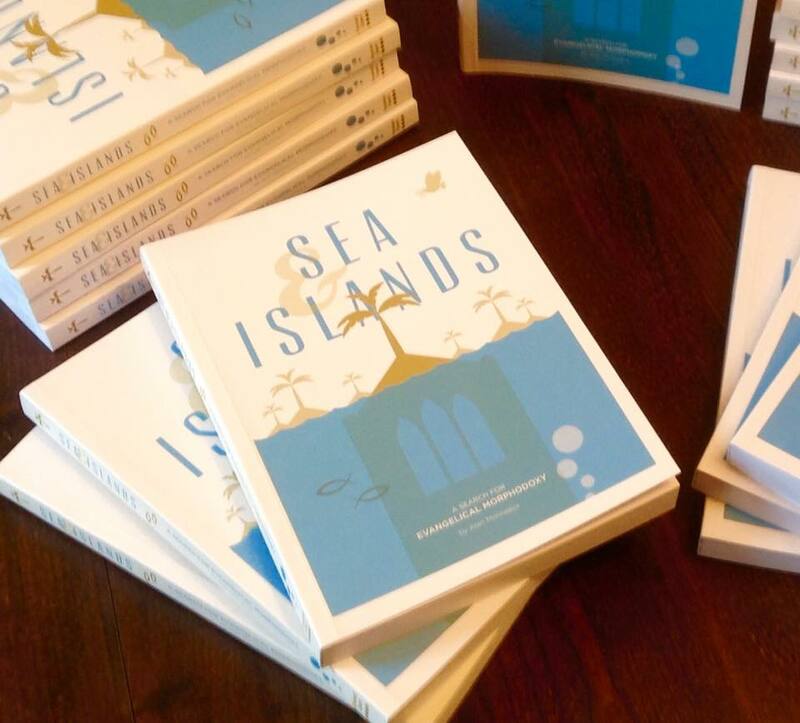 Sea and Islands is my attempt to articulate a dissatisfaction with the certainties and tribalism of evangelicalism. I wanted to give some glimpses of the battle that Bev and I have had in trying to both deconstruct our beliefs and hold onto a faith in Christ. After the death of his mother, C.S. Lewis expressed his loss of certainty by writing, “It was sea and islands now; the great continent had sunk like Atlantis”. In a similar way, there has been something of a seismic shift in the topography of the evangelical world over recent years. Some of the old certainties seem to have sunk like Atlantis and left behind sea and islands. Some people have explored this new environment and begun a journey towards a more progressive position. In reaction, others have run back to some of the old certainties in search of a more secure continent of belief. In this book I describe our own discoveries in the context of church leadership. The book’s subtitle is A Search for Evangelical Morphodoxy. What do you mean by this, and why does it matter today? Essentially I used the author privilege of creating a new word where one did not exist. “Morphodoxy” is my attempt to show that evangelicalism is not the static construct of belief that church leaders suggest. To critique evangelical doctrine is not necessarily to be heretical, even though that is what one is often accused of. In the book, I try to show why our main motif should be “incarnational” – our goal is constantly to look to become part of the community in which we serve. The change seen in Philippians 2 is our model – namely, letting go of our privilege in order to become like the “other”. In this respect, evangelical orthodoxy is always morphing – hence “evangelical morphodoxy”. Why did you write this book? What is the fundamental need in the church that it seeks to address? The book was initially a personal journey. I needed to articulate some of the things we were wrestling with. As I sent sections to others who were also struggling, it became clear that people resonated with some of the themes. The church has become so engaged with empire that it has lost its radical edge. We no longer speak truth to power but use power to trap people in unhealthy constructs. Can you give us an overview of the three or four key themes or ideas that run through the book? Firstly, as mentioned earlier, incarnation should be our main model. It gives meaning to both the cross and the resurrection. Evangelicals have been so cross-centred that they have missed the genius of God becoming human. The gospel’s power is found in vulnerability. Secondly, I offer a critique of the way that evangelicals measure success in ministry. Leaders become motivated by the wrong drivers, most of which mirror corporatism rather than Christ. Thirdly, I try to show how we are to be gardeners rather than warriors. A good deal of evangelical theology and leadership practice draws its ideas from aggressive models. This often leads to an “ends justifies the means” culture where people are commoditised. Who did you have in mind as you wrote this book? What kind of audience do you think will most benefit from it? Rather counter-intuitively, I have written this book for a small audience. I am not trying to shake anyone’s faith. The main direction of my critique is upward towards the seats of power within the church. I have a great deal of sympathy for people who are caught up in the often unhealthy constructs we create in evangelicalism. The book is for those within evangelicalism who wish to deconstruct their faith while holding to some idea of hope. I hope that those who have been hurt by the church will find a compassionate description of why the church can be unhealthy. Churches on both sides of the Atlantic are experiencing a decline in numbers. What would you say to those who still cherish their faith but are disenfranchised with church? Firstly, I would say “Do not go to unhealthy churches”. We have been so conditioned to think that God cannot meet us outside of the church that we become superstitious about not attending. Secondly, let the continent sink but look for the islands. Some of the models we have embraced deserve to die: let them go. Having said that, there are pockets of hope. Look for them. Embrace them. Thirdly, if church is too painful for you, find community in other ways. Be a good human being while being in relationship with other people. Don’t be afraid to explore online communities. My belief is that God is big enough to do what is needed to meet you in these places. What advice would you give to church leaders who want to foster vibrant and relevant communities without giving in to fads and fashions or trying to please the crowd? Firstly, uncouple every event you do from a revenue stream. Once you rely on the money you are likely to keep something going for the wrong reasons. Secondly, don’t take the direct route towards growth. In fact, I would say don’t make numerical growth your goal. It is better to create places of safety, inclusion, and hope and then let the rest unfold. Thirdly, don’t build a franchise model of church. Be incarnational. Live and breathe with the community and allow the genius of the Holy Spirit to direct you towards a model that is healthy. In what ways do you think evangelical churches will look different in ten or fifteen years’ time? At times of change things tend to polarise. Some churches will push hard to show that the old megachurch models are the gold standard. My belief is that we are already seeing new communities of hope beginning. The problem is that you cannot measure these new communities by the same key performance indicators used by megachurches. This means that this deconstruction looks like it has failed. It doesn’t tend to produce large churches and distinct hierarchical structures. Thus it will look like the evangelical church is failing, when in fact it is being translated into other expressions. Is there anything else you’d like to say about your book? I know it won’t be read by many people, but I hope it will encourage some people to explore deconstruction and reconstruction in a way that is helpful. I hope it will help some to have a confidence in a gospel that is more inclusive. I’d like to once again express my sincere thanks to Alan for his willingness to spend some time answering my questions. I think his comments – and his book – contain some refreshing nuggets of insight for those questioning how they might continue to “do church” in healthy ways in the twenty-first century. If something you’ve read here resonates with you, why not share it below in the comments?